SAO PAULO | Grade-school students in a northeastern Brazilian city are using uniforms embedded with locator chips that help alert parents if they’re cutting classes, the city’s education secretary said Thursday. Twenty thousand students in 25 of Vitoria da Conquista’s 213 public schools started using T-shirts with chips earlier this week, secretary Coriolano Moraes said by telephone. 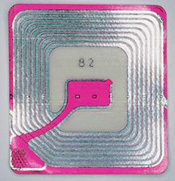 By 2013, all of the city’s 43,000 public school students, aged 4 to 14, will be using the chip-embedded T-shirts, he added. “We noticed that many parents would bring their children to school but would not see if they actually entered the building because they always left in a hurry to get to work on time,” Moraes said in a telephone interview. “They would always be surprised when told of the number times their children skipped class. Moraes said that Vitoria da Conquista is the first city in Brazil “and maybe in the world” to use this system. “I believe we may be setting a trend because we have received many requests from all over Brazil for information on how our system works,” he said. LONDON | Every British taxpayer is to receive a personal statement detailing exactly how their taxes are being spent as part of the government’s drive to make the tax system easier to understand and more transparent. British Treasury chief George Osborne was expected to announce in [last week’s] budget that Britain’s 20 million taxpayers will receive the annual statements [starting in] 2014. “It is quite right that people know how much tax they pay and what it is spent on,” a person familiar with the matter said. The statements will set out how much income tax and National Insurance – workers’ contribution toward the state-funded health system – each taxpayer contributes. It will also break down the main areas of spending on public [government] services and how much of the taxpayer’s contribution goes on each. An example statement released by the Treasury shows that a person earning £25,000 (around $40,000) a year will have taken home almost $31,000 and paid $9,051 in tax. A pie chart showing how the government spent the taxes shows the largest chunk – $3,017 – went to welfare, while $1,576 went toward health. The taxpayer would also have contributed $576 toward paying interest on the government’s debt. Juan Manuel Santos says there will be no let up in operations against the FARC. BOGOTA – Colombia says its armed forces, using air strikes and ground attacks, killed 33 Marxist guerrillas [members of FARC, in a] 24 hour [period last week] in the remote, oil-rich region of Arauca, the same place the rebels attacked and killed 11 soldiers days earlier. President Santos said the number of rebels killed was 24, but Defense Minister Juan Carlos Pinzon told reporters later that the toll was 33 rebels. He said six other FARC fighters were also killed in different parts of the country, bringing to 39 the number of rebels killed in 24 hours. Representatives from Ecopetrol and Occidental weren’t immediately available for comment Wednesday. The FARC, as well as the National Liberation Army, or ELN, each have a strong presence in the Arauca region. While both rebel groups are seen as weaker than they were a decade ago due to a military offensive by the government of former President Alvaro Uribe, there has been a resurgence in rebel activity since shortly after President Santos took office. Last month, the FARC announced it was abandoning its decades-old practice of kidnapping civilians for ransom, a move analysts said could eventually lead to peace in the country beset by war. President Santos, however, says he is willing to talk peace with the rebels only if they end all violence and release their remaining civilian and military hostages. b) How many of the city’s students 14 and under will be using the chip-embedded t-shirts by 2013? c) Education secretary Moraes thinks his city may be setting a trend because they have “received many many requests from all over Brazil for information on how our system works.” Why did the city implement this system? d) Do you think schools in the U.S. with the same problem should utilize this solution? Explain your answer. b) Should the U.S. government do the same? Explain your answer. c) Ask a parent the same question. Compare your answers. 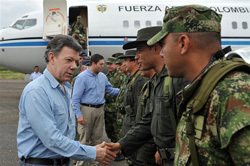 b) What must FARC do before President Santos will enter peace talks with the group? The Vitoria da Conquista city government invested $670,000 to design, test and make microchipped T-shirts for students, according to education secretary Coriolano Moraes. The rebel attack unleashed harsh public criticism against the Santos government, which has so far retained solid approval ratings. Parents of the soldiers killed went on television claiming their young sons were thrown into the dangerous region with little preparation or backup, making them sitting ducks for the highly trained guerrillas. President Santos and top military officials had vowed to strike back at the rebels, who have been waging a guerrilla war against the Colombian government for nearly half a century. The northeastern state of Arauca runs along the Venezuela border, in the upper part of Colombia’s eastern plains, where more than half of the country’s oil production comes from. Arauca has long been a hotbed of leftist guerrilla activity, partly due to its remoteness but also because of the presence of foreign oil companies that the rebels view as potential targets. The rebels also see the oil companies as funding sources by way of extortion. Among the companies operating in Arauca is California-based Occidental Petroleum Corp. and national oil company Ecopetrol.